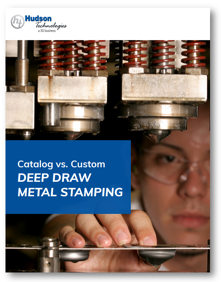 What Are the Benefits of Custom Metal Stamping? When working with little or no tooling, Hudson’s catalog is an excellent way to begin prototyping your new project. But when Hudson’s catalog enclosures won’t meet clients’ specific needs, custom metal stamping is often an ideal choice. Fill out the form on the right to access the eBook.